Nicely Gift Wrapped 250 Gms. (Gross Weight) Assorted Sweets from Haldiram and 1 Rakhi, Roli Tilak and Chawal. Send this Rakhi Gift Anywhere in India. 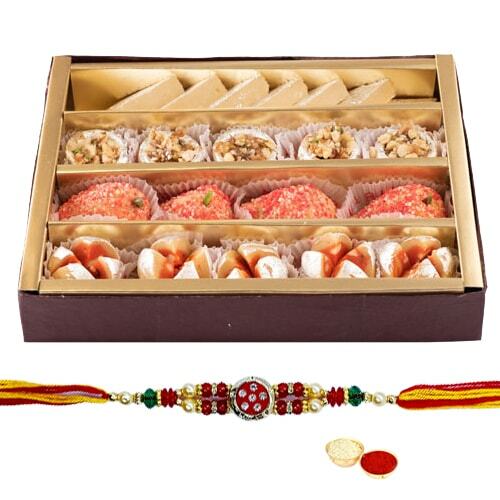 This special Rakhi Gift will make your loved ones feel happy. Nicely Gift Wrapped 250 Gms. (Gross Weight) Assorted Sweets from Haldiram and 1 Rakhi, Roli Tilak and Chawal. Nicely Gift Wrapped 250 Gms. (Gross Weight) Assorted Sweets from Haldiram with a Designer Steel Thali (Thali size 8 to 9 inch.) and 2 Rakhi, Roli Tilak and Chawal. Nicely Gift Wrapped 250 Gms. (Gross Weight) Assorted Sweets from Haldiram with a Designer Steel Thali (Thali size 8 to 9 inch.) and 4 Rakhi, Roli Tilak and Chawal. Nicely Gift Wrapped 500 Gms. (Gross Weight) Assorted Sweets from Haldiram with a Designer Steel Thali (Thali size 8 to 9 inch.) and 1 Rakhi, Roli Tilak and Chawal. Nicely Gift Wrapped 500 Gms. (Gross Weight) Assorted Sweets from Haldiram with a Designer Steel Thali (Thali size 8 to 9 inch.) and 2 Rakhi, Roli Tilak and Chawal. Nicely Gift Wrapped 500 Gms. (Gross Weight) Assorted Sweets from Haldiram with a Designer Steel Thali (Thali size 8 to 9 inch.) and 4 Rakhi, Roli Tilak and Chawal.